First and foremost I would like to say writing this article is really difficult for me because I was in denial that I had PCOS and this is the first time I am going public with it… so bare with me. After giving birth to my precious little girl back in 2007, I developed a lot of problems physically and even emotionally; that I NEVER had before – so of course I assumed they were all somehow related to my delivery and postnatal changes. Why might assume that? well let’s rewind a little bit; for the sake of some background – my pregnancy went pretty smooth with very little complications, I was happy about that because I know many others who had a ton of problems… the only problem I had was that baby seemed like it was only getting bigger and bigger… too big… at my last sonogram they told me she was going to be almost 11lbs! so in the last two weeks of my pregnancy I gained over 20lbs – so my MD decided to induce me 4 days before my due date. On my last visit to my OB-gyn, all the tests went exactly as they did for the previous 9 months, the final results were good and I was excited to get this baby OUT! Because it seems as though my face, logs, ankles, body swelled up into a balloon and I just couldn’t hold all that weight anymore. So I went in to deliver at 5:00am on Oct 24th. Once I got to the hospital they checked my vitals, urine and the baby’s heart rate… I wasn’t too worried since everything looked good the evening before… but unfortunately that’s when sh*t hit the fan. All of a sudden there were large amounts of protein in my urine and my blood pressure was sky high – I developed a sudden onset of Serve Preeclampsia “over night”. So they did what every paid medical professionals do – they attached me to over 6 different IV’s, a blood pressure monitor and wrapped my calves into circulation pump machines. I was scared just by looking at my husband and mom’s faces; after they took a look at me. A few hours later my water broke and my OB-gyn wanted to give me a C-Section, but I really didn’t want surgery so I asked him if it was okay to see if my labor progressed some more first… about 27hrs later – my labor didn’t progress and he told me that if the baby was not removed both she and I could well… you get the picture – so I freaked out and went into an emergency C-section. P.S apparently all that swelling (associated with preeclampsia) was the reason my baby came up huge on the ultra sounds, cause of all the water I was retaining – she was born at 8lbs; not 11+. So, back to the original post…Once a good 6 months passed I began to wonder “damn, how long is this going to last!” and “hmm, maybe it wasn’t related?” since I didn’t know where any of these symptoms had come from I did what anyone else would: look up the symptoms online… and boy did I get what I asked for. My Google search came up with thousands of potential illnesses, diseases (chronic and otherwise) that I could be associated with and some of them really freaked me out! Some days my symptoms would subside and I would have a normal day and forget about it all… then other days I would freak out all over again – this was an on going thing and I did not want to go to the doctor for it cause I figured it would be a waste of my time. About two years past and my husband and I starting thinking about baby number two… yes I know “why after what you went thru at the delivery of baby number one!” (I get that a lot) — well it’s because I want her to have a little brother or sister. So after getting off Birth Control pills, I gave myself a month for the pills to get out of my system and we began trying t.t.c. After about 10 months of trying… I began to wonder what was going on; since the first time I never had an issue conceiving. I also developed a severe case of forehead acne that kind of looked like a rash. I called a new OB-gyn, since mine moved and he told me to wait two more months and if it doesn’t work to see a fertility specialist and for the acne he recommended I go see a dermatologist. I decided to wait and keep myself busy by seeing over 4 dermatologists to deal with the acne >> all of recommended I take Accutane to get rid of my ‘adult acne’ but when I asked them if it was a wise idea, cause I was trying to conceive – I was given a “Pregnancy Category A” topical cream, that did nothing to get rid of my acne. So he prescribed me something called “Metformin” which is an oral medication that helps with insulin resistance and regulating your periods. I began taking Metformin and within the first months I lost almost 8lbs! which was wonderful… but then the fun stopped and the weight slowly began to climb back up. …So now I was left with PCOS… on a perscription medication called “Metformin” and on Clomid; a drug to help me ovulate. Get support: http://www.soulcysters.com get on their message board for Q&A’s; help and over all information. 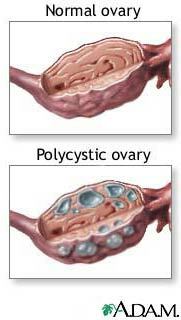 I was diagnosed with PCOS last year, but remained unfazed, as I always had irregular periods and acne problems. There is no need to fear or be embarrassed! Up to 10% of women have this condition, and metformin, diet and exercise are great ways to lessen the symptoms, or diminish them altogether! I stopped Metformin, I guess maybe I should give it another go… although my periods have gotten pretty regular, even without it.